Friendship bracelets are fun to make, to give, and to receive! 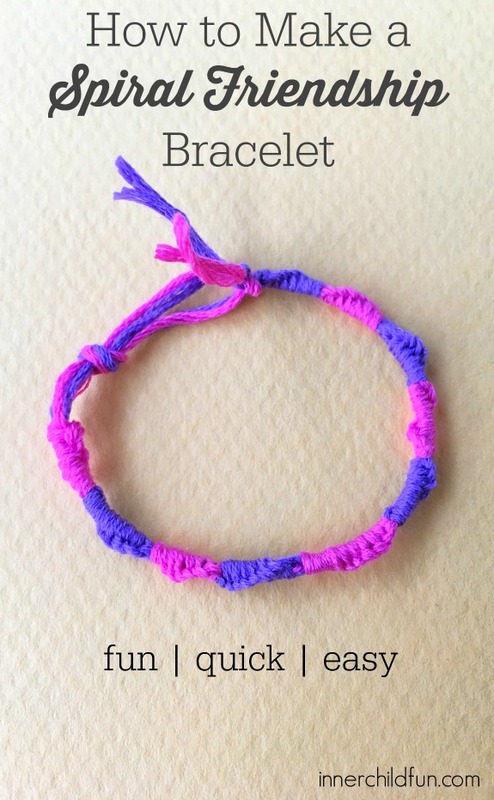 This spiral friendship bracelet is the perfect beginner project because it is quick and easy to make by using the same knotting technique over and over. My kids and I made several of these in so many different color combinations. A big thank you to our friends at Melissa & Doug for sponsoring today’s ideas for creative crafty fun! 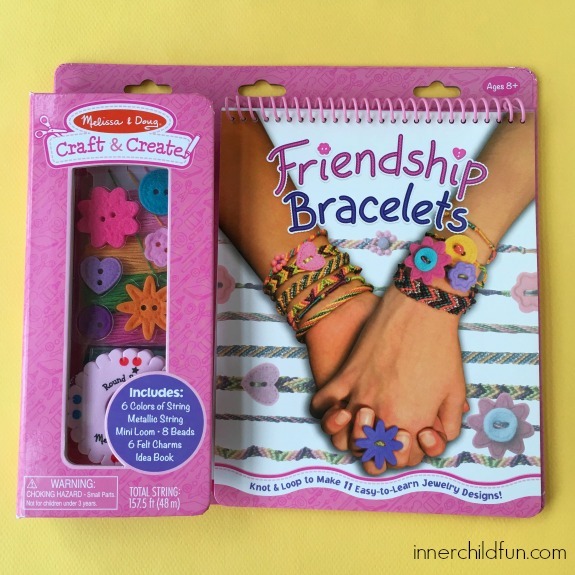 To make our friendship bracelets, the kids and I used the Craft & Create Friendship Bracelets Kit from Melissa & Doug. It is recommended for ages 8 and up and retails for around $8.00. This kit brought back so many great childhood memories of making these bracelets when I was a kid! Teaching my kids how to make these friendship bracelets was so much fun, and they cannot wait to give their creations to their friends! To make a spiral bracelet, cut two pieces of string 48 inches long each. My clipboard is about 12 inches long, so I wrapped the string around the clipboard 2 times before cutting. Fold the string in half and tie a knot. Attach to the clipboard. Repeat with the same strand about 8 times. Switch to the second strand and repeat another 8 times. Continue with this pattern until your bracelet is complete. That’s it! These spiral friendship bracelets are so much fun to make and to give as gifts! 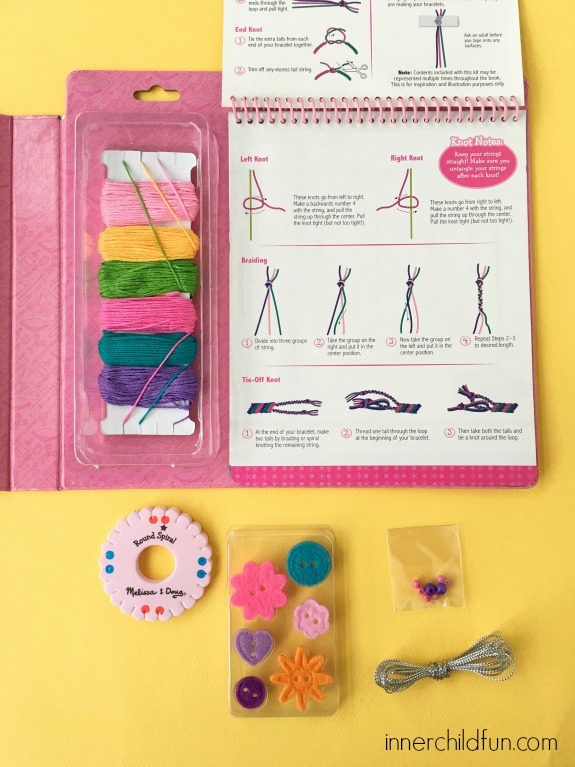 Once you’ve mastered this spiral friendship bracelet, you may want to try making the other bracelet designs featured in the kit. There are designs and detailed instructions for every skill level. Fun!